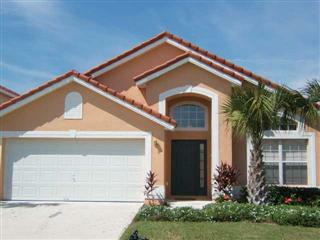 Sunbeam villa, as the name suggests enjoys a sunny position. You immediately feel warm and sunny inside when you arrive at the villa with its Elegant Floridian style and swaying palm trees outside to complete the welcome. It is a four bedroom villa, comprising of 2 master suites and 2 themed twin rooms. 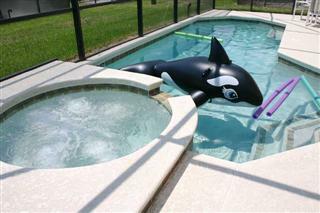 Like all our villas, it has its own pool, spa and games room and details of those can be found below. As you enter Sunbeam you walk into the first of the two lounge areas which is very modern and has a wonderful calming feel. The sun beams through the lounge windows first thing in the morning and is the perfect place to sit with your coffee as you wake up for the exciting day that awaits you. It features two comfortable suede sofas which are ideal for some quiet relaxation or reading a book, whilst the other family members can watch tv or play with the games system in the main family room lounge at the other end of the villa. 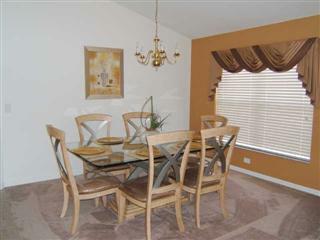 The lounge are leads through to the dining room. Like most Floridian style homes Sunbeam Villa is a very open plan design which gives a wonderful bright and spacious feel. The dining room furnishings follow the contemporary style of the villa and provide the perfect ambience for entertaining with friends and family without being too formal. The table comfortably seats 6 and also provides a little more space than the kitchen table for everyday dining if you prefer. The dining area leads through a passageway to the kitchen. 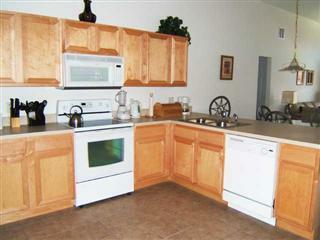 The kitchen provides all the necessary items to make your vacation a smooth one! You will find the very important coffee maker and an electric kettle for those that prefer a nice cup of tea! Other items include a toaster, blender, microwave, full self-cleaning oven, easy clean ceramic hob, dishwasher, fridge freezer with ice maker, cutlery, kitchen knives, crockery, bakeware, can openers (electric and manual) and even a pizza baking tray and cutter. The kitchen is therefore fully equipped for heating a pizza to making a gourmet meal. Plastic ware is also provided for your outdoor dining which enables you to enjoy the spa and pool area safely. The kitchen is at the centre of the villa and leads through to the breakfast nook which seats four at the table and has 2 stools at the breakfast bar. 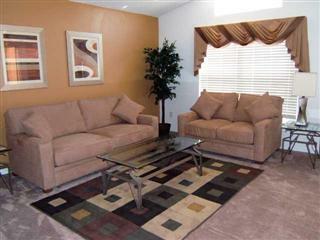 The theme here is most certainly sunshine with the furnishings and the view through the family room to the pool area. It is a lovely, bright area to sit and have a meal or snack. The family room which leads from the kitchen provides comfortable leather sofas to relax in any time of the day to watch the large screen TV. 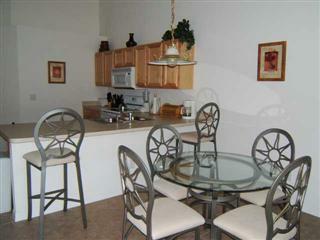 You are able to enjoy the company of those preparing food in the kitchen as well as enjoy the view of the pool deck. The furnishings continue the modern contemporary theme throughout the villa. There is a large wall unit which houses the Playstation2 and games, traditional board games and a selection of DVD's suitable for all the family. There is also a music 'boom-box' so that you can hear music whilst relaxing on the pool deck if you so desire. 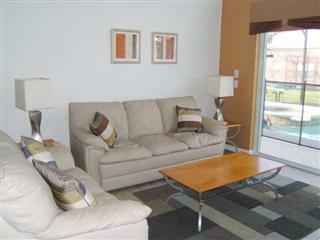 The family room is situated at the rear of the villa and has a large double glass door that leads out to the pool area. The door has a child alarm fitted for safety. The sunsets behind the pool area, so it is a wonderful room to sit and enjoy a relaxing drink whilst watching some tv and before heading out for the evening to dinner or perhaps one of the many evening events at the theme parks or nightclubs close by. The master bedroom is situated on the left side of the villa and takes a New York Manhattan theme with its lines and geometric patterns. 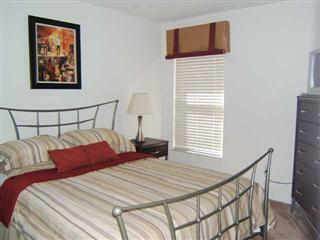 The large US king sized bed has an upgraded mattress to ensure a restful nights sleep. The dark wood furnishings and contrasting modern silver tones feels luxurious and rich but keeps a soft relaxed flow about it at the same time. There is of course a TV, clock radio and hairdryer. The master bath has a full tub as well as a separate walk in shower, a doored WC, large wash basin vanity unit. It leads through to a large walk in closet/dressing area. The remaining bedrooms are all on the other side of the villa along a corridor. Master bedroom 2 at the villa front has a New Orleans Jazz feel. Again like the other master bedroom, simple lines and silver tones make this room feel modern and fresh. 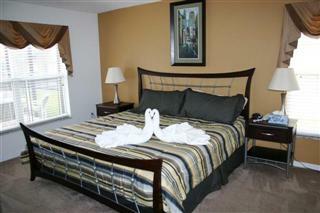 There is a luxurious US queen size bed with upgraded mattress and linens and scatter cushions. The room has its own TV, radio alarm clock and hairdryer. There is a closet and ensuite bathroom with shower over the tub, wash basin vanity unit and WC. Next to the second master is the first of the 2 twin rooms and it is aimed more at our younger vacationers, although older members would still feel welcome! The theme is 'Finding Nemo' and everything from the bedding, the rug, wall pictures, clock and even a couple of soft toys to cuddle up with are Nemo! There is a closet in this room too and the portable bed rail will usually be found in this closet for your convenience. 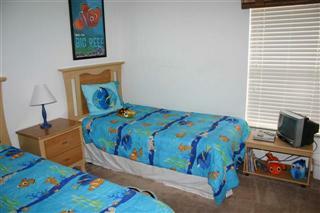 This is a very popular room with kids, especially those feeling a little 'Mickey'd-out'! Surf's up in the final of our bedrooms. 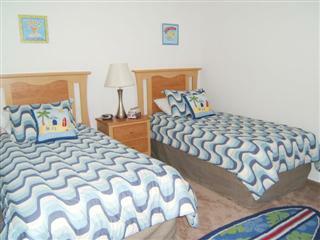 This twin room has a Hawaiin Surf theme which is popular with a wider age range. With wavy bedspread, surfboard sheets, surf scatter cushions and surfboard rug it is easy to forget you are in Central Florida! It also features a radio alarm clock, hairdryer and closet - complete with surf board handles! As mentioned above, this room shares a bathroom with the other twin room. This is opposite the family room for convenience. 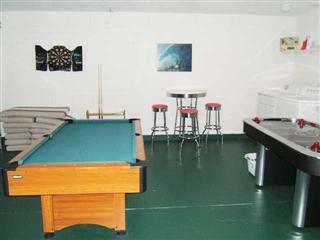 There is a games room in the garage that has a door from inside the villa located behind the front entrance hall. There is a pool table, air hockey, electronic darts and a toy box. There is even a set of golf clubs available free to use at your leisure. This is also where items like the travel cot, high chair, stroller, and BBQ can be found. There is also full laundry facilities here with a washer, dryer, iron and ironing board, although we don't want to talk about doing laundry on vacation! The pool deck is at the back of the villa and has doors leading to it from the family room. There is a pool alarm that you can choose to have on or off as required as well as a safety fence on the deck to ensure children's safety. This fence is required by law but can be folded back by guests that do not wish to keep it up. The pool enjoys the beaming sun from mid morning through to the sun setting and you will feel totally like you are in you own touch of paradise. The deck area has a light and the pool is illuminated too. 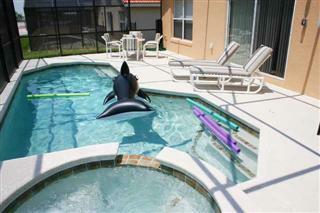 Pool accessories are provided as well as sun loungers, a table and chairs. There is also an electric BBQ grill that is really quick and easy to clean. The spa adjoins the pool and comfortably seats 4 adults at any one time. 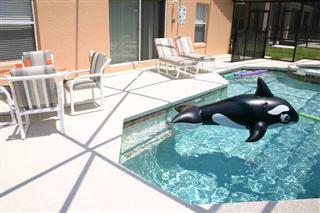 This is just the perfect way to unwind after a hectic day at the parks or to rest your feet from lots of shopping. With a cool drink watching the sun setting it really is vacation bliss. The gentle waterfall from the spa to pool provides a relaxing ambience. 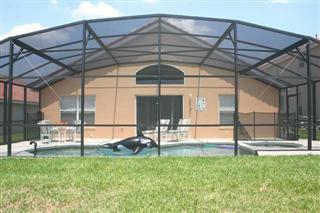 The pool has a mesh lanai surrounding it to keep out the bugs & insects. 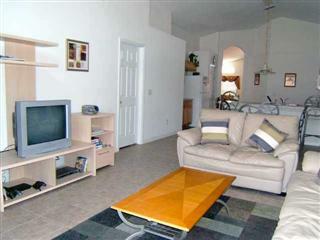 We hope this has given you an informative tour of Sunbeam Villa. It goes without saying that all linens, towels and pool towels are provided in the villa and like all our villas there is a safe for your use. The villa i sless than five years old and all the photos that we have shown are up-to-date and we have a continuous replacing, upgrading and maintenance program to ensure that the villa is as you have seen it here, if not better. Sunbeam villa really will offer you a relaxed, modern and spacious home from home for your vacation that provides everything you could require. This will ensure you want to return to the beaming sun on Sunbeam villa time and time again.